Bring the big screen feeling home with a simple or state of the art home theater or media room. The design goal is to create a space that allows for the full cinematic experience with the comfort and ease of being at home. We can help you create a room with cinema-quality audio and video, life-sized screens, and a powerful audio system. Theater seating is available in a multitude of styles and sizes, allowing you to choose seating that is both comfortable and aesthetically congruent with your design theme. Audio, video, and lighting can be effortlessly controlled from a tablet or smartphone. Your home cinema will reflect the movie-going experience without the hassle of leaving the house. Theater lighting needs to be designed to accentuate your personal design preferences and the aesthetics of the room. Low-profile lighting fixtures will set the mood and create an immersive, entertaining experience for yourself and your guests. Floor lighting can also be used to light walkways or steps for safety. An adjustable lighting system design can provide ambience and optimize the performance and viewing on your screen of choice. 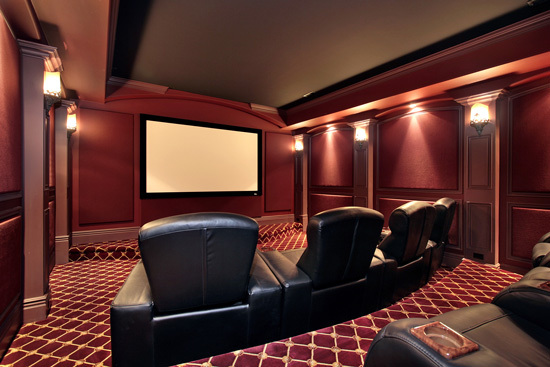 The most important element in a home theater is the screen. Flat panel TVs are available for home theaters and offer a bright and dazzling image. If you would prefer a larger viewing surface and have a room proportionately sized for a larger screen, the best option is a projector and screen. Projectors can fill an entire wall and create a theater-like experience. There are different aspect ratios (height to width ratio) screens available, the most common are: Widescreen (16:9) and Cinemascope (2:35:1). The widescreen aspect ratio is most commonly used for HDTV and non-HD television viewing and is the standard for DVDs. Cinemascope screens provide the full image of a film that is shot in this format. These screens provide a more cinematic experience and can make the viewing experience more exciting. We can help you choose which screen is best for your theater and viewing preferences. The sound system is what brings you to the edge of your seat. Whether it is the suspenseful music, hopeful love song, or the gunfire and explosions, the audio drives your emotional responses to a movie. Our goal is to deliver the best sound possible to every seat of the theater. The room acoustics are a critical component to getting the sound right, as such; acoustic absorbing and diffusing materials are often incorporated into the design. The room size, room layout, and seating, help determine the number of speakers and subwoofers we will use in your system to create realistic, room-filling audio.